Liora Manne Natura Compass Indoor/Outdoor Mat Natural 18"X30"
Our Compass mat adds a splash of color and a sophisticated nautical look to your doorstep. This coir utility mat is both stylish and practical. Natura coir doormats are durable and beautiful. Crafted from 100% coir which is an all-natural material known for its resistance to the elements. Coir is eco-friendly, made from natural fibers which are extracted from the outer shell of a coconut known for its durability, strength and water absorption. Natura coir mats can withstand all weather conditions and are available in a wide variety of designs ranging from classic, inspirational, nautical and whimsical patterns. Dyes saturate the fibers for vibrant long-lasting color. 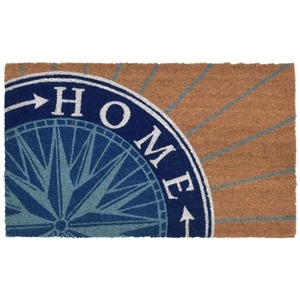 Liora Manne Natura Compass Indoor Outdoor Mat Natural Measures 0" by 0"
Liora Manne Natura Indoor/Outdoor Mat 18"X30"